Pass your trailer driving test with flying colours here at Pass ‘N’ Go and get the licence you need to tow a caravan, horse box and more. drive a vehicle up to 3,500kg MAM towing a trailer of up to 750kg MAM. Tow a trailer over 750kg MAM as long as the combined MAM of the trailer and towing vehicle is no more than 3,500 kg. In general, this means that you cannot legally tow trailers such as: horse boxes, caravans or large trailers unless you pass the car trailer test (Category B + E). Also, if you have been disqualified from driving and passed a test since 1st January 1997, you will have lost your entitlement to tow and you will have to pass a separate car and trailer test. If any of the above applies to you, book your trailer training online by either choosing the course option best for you below or using the contact form at the bottom of the page to get in touch. Please note: Towing a trailer when you do not have the entitlement will invalidate your insurance. This can lead to prosecution with a fine and/or penalty points on your driving licence. Not sure which trailer training course to choose? 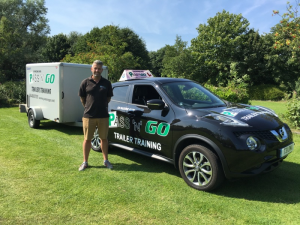 Would you like to get in touch with Pass ‘N’ Go about our trailer driving test before booking onto a course? Please give us a call or drop us an email, as we would love to hear from you and will aim to provide you with a solution that perfectly suits your requirements.